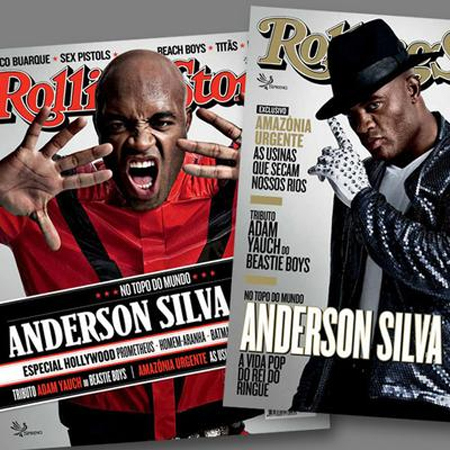 Move over UFC Magazine and GQ Brazil, Anderson Silva is movin’ on up. The reigning UFC middleweight king is gracing the cover of Brazil’s latest edition of Rolling Stone. Although Silva has expressed his undying infatuation for Justin Bieber over the last year, “The Spider” dons Michael Jackson’s duds in the music magazine. The move makes perfect sense, as June 25th marks the three-year anniversary of Jackson’s death and Silva was imitating the King of Pop long before Bieber had garnered even one Belieber. Silva defends his throne against Chael Sonnen July 7th at UFC 148.